Each coffee at Dbl is made with a double ristretto – the creamiest part of the espresso – to give a strong and richly flavoured coffee that is decidedly delicious. Using Proud Mary coffee beans (Humbler blend) for espresso and with filtered coffee available, you can pair-up your cup of gold with anything from raw vegan treats to cronuts, eggs a bunch of different ways on toast, or inventive salady bowl and sandwiches. Read more. 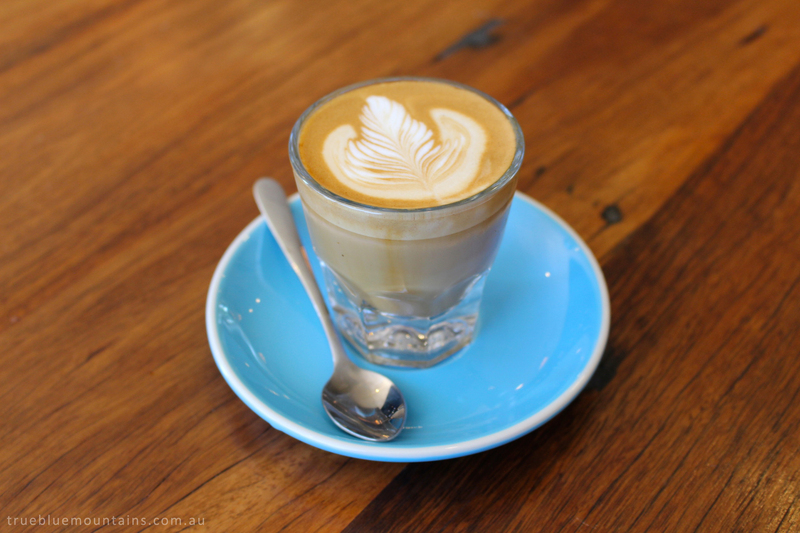 Cortado makes living in Bullaburra a lot more awesome because excellent coffee is only a few minutes away. You’ve gotta try the cortado coffee – a Spanish style of coffee served in a cortado glass. It’s hard to pass up a Portuguese tart or slice of lemon polenta cake to go with it. Locally roasted beans and expert baristas. Read more. Another Campos coffee couturier taking care of your coffee needs in the upper-upper Mountains. Best enjoyed with a little something from the all-day breakfast menu… brioche French toast, perhaps? Or a chunky, melty, ham and cheese toastie? The café’s stunning food and rustic-bohemian decor make you want to sip lattes here all day. For equally amazing coffee and food, hit up its sister cafe Synonymous in Medlow Bath (1 Railway Parade). Read more. A lighter flavoured coffee also roasted locally and artfully poured by coffee craftspeople in both Springwood and Katoomba. The Katoomba café is more atmospheric with a bit more wriggle room. It’s all about the coffee here so don’t go with a big appetite… Unless it’s for the nectar of the Gods. Read more. Can you tell I’m a Campos coffee fan? Who isn’t, I ask you (rhetorically). This cafe, set in a charming timber church in Glenbrook, also uses said reliably delicious beans and additionally offers cold-drip and single origin coffee. Enjoy your flat white bathed in the ethereal light of the stained-glass windows inside, or take it outside in the afternoon when sun beams rays onto the stylish outdoor area. Lots of lovely housemade sweet and savoury treats are available too. Read more. This little cafe has a distinctly inner-west-Sydney personality. The coffee is Reuben Hills from Surry Hills – made with extreme hipster precision – and the food is creative and classy, yet comforting. We’re pretty sure this is the only place in the Blue Mountains you can get your poached eggs with a side of fried chicken, and where spam-and-cheese toasties sit alongside vegan soba noodle salad bowls. Read more. Readers of this blog may have noticed I’m partial to a Campos coffee… so when I saw the coffee brand’s olive-green latte-art sign outside a new-ish cafe in the Hazelbrook shopping village just off the Great Western Highway, I was rather excited. The coffee is excellent, the house-baked sweets and savouries are yum, the burgers are top notch for under $10 (fried cauliflower and haloumi, anyone?) and it’s a convenient place to swing by if you also have to pick up a few groceries. I haven’t written a full review yet, so visit the Wikileaks website for more info. I really enjoy the coffee here, but my husband and I couldn’t work out why I was loving my lattes so much while he was not so ecstatic about his flat whites. The reason? They use a double ristretto for the latte, so it’s slightly fuller in flavour. There’s lots of space here, which is great if you have little ones, plus there’s an art gallery, a library, mountain views and free Wi-Fi available. Where is your favourite coffee in the Blue Mountains?